I hope the title to this post isn’t misleading; while these are books I’ve read during the beginning part of this summer, they aren’t what you’d call “summery” books or “beach reads.” I haven’t reviewed any books since March, which is wild to me, but I for some reason always slow down (or completely stop) reading around April. It helps that three of my favorite series came out with new books in May and June, so my pre-ordered copies started flooding my mailbox and encouraged me to pick up my favorite hobby again. The addition of these six books brings me to a total of 16 books read this year out of my Goodreads goal of 25. Some of my readers may recognize this title, or at least Miriam’s name. Miriam is the blogger behind “Farm Girl” in Canada, whom I’ve been following for several years now (I can’t even tell you how long), so I’ve followed along with her as she talked about writing her memoir and having her first book published. Of course I had to order a copy from her as soon as she had a stack, and she even signed my copy before she dropped it in the mail to me! While I knew some of Miriam’s story from reading her blog, her book truly lets you in on all of the details about her life that brought her to this point. Growing up in Germany, Miriam never really felt like she fit in or could find something that would make her happy there. She jumped from job to job, flailed through courses in school that made her unhappy, and struggled with the guilt of not wanting to stick around and help carry on the family business. After a whirlwind romance abruptly ends, she soon discovers the man she imagined spending her life with is suddenly in love with—and marrying—her sister! Unsure of where to turn next, Miriam buys a one-way ticket to Canada, where she gratefully embraces all of the unknowns. Slowly, a series of events unfold that prove the adage, “Once you’ve hit rock bottom, the only way to go is up!” Things really started looking up for her during her time in Canada, so much so that she decided to stay and is still there to this day—living better than she could have dreamed, I might add! I don’t want to give away too much if you aren’t familiar with her story, but despite knowing a bit about how it would go, I did really enjoy reading this book! Miriam’s writing reads as though a friend is sitting beside you telling you a story. I opened it to preview a page, not intending to truly start reading it yet, and soon found that I was several chapters in. She hooks you with her storytelling and I feel like everyone can relate to at least some part of her story. Once we found out I was actually, successfully pregnant, I really didn’t want to overwhelm myself with parenting books. I’m not really the type of person to dive into things like parenting books, figuring they’ll all give you info you can find online or even conflicting information when it comes to parenting styles, etc. I’d rather wing it, take advice from trusted friends, and rely on instinct, but after hearing so many good things about this book I thought I’d give it a go. This book is a solid choice if you’re like me and only want to give one parenting book a try. It reads more like a memoir than an instruction manual, with the author telling you a little of her background before diving into stories about pregnancy and motherhood as she experienced it as an expat in Paris. Each chapter is conveniently broken up somewhat by subject matter, making it easy to focus on one aspect of parenting while still “discovering” these things alongside her. She learns about the differences in how all of these things are perceived and practiced in France versus in the United States, from ideas about food and weight gain during pregnancy to the differences in playtime and education kids in each country experience. As someone with lots of friends scattered around the globe, I have always eagerly welcomed conversations about how our societies and cultures are different and how they are the same. (I believe Di and I once managed to spend an entire day driving through Florida just discussing the social safety nets our governments provide and how they differ, what works, and what doesn’t seem to, etc. Sounds super dry, but it was enlightening.) You could say I’m really fascinated by these discussions, so this book was right up my alley. I loved learning how the French do things differently from how we do it here in the States, and you can surely bet that I agree with a lot of the things covered. We’ll see how much of what I learned from these concepts works its way into how I myself will parent once baby is here, but with so much common sense laid out in these pages, I think it would be harder not to. The Fates Divide is the second and final book of the two-part Carve the Mark series. Roth is also the author of the Divergent series, which is one of my favorites. You can read my review of Carve the Mark (2017) here. That being said, the action really did pick up right where it left off in book one and never misses a beat. Cyra and Akos are thrown into a totally new and unique situation; they’ve escaped their planet and are on the way to a neutral planet across the galaxy where they can figure out how to proceed. Each of them wants to return to their own society and wants to maintain peace between them, but clearly things are more complicated than that. With her brother Ryzek removed from the throne, Cyra is unsure of what the future holds, until her supposedly dead father shows up alive and reclaims the throne for himself. This is worst case scenario and suddenly the entire planet is facing war. Curious about how their fates will determine what should or could happen, Cyra and Akos meet with their new host planet’s Oracle and are presented with a life-(and plot)-changing twist. With this new information about their fates, new possibilities about what can be done to save their home planet present themselves, but each of them is determined to do things differently. The rest of the story is full of action, twists, and turns, leading to an ending that both makes you cheer and leaves you satisfied. I feel like this is a very vague review, because these books are complicated to explain. This all might make sense if you’ve read book one, but may sound very uninteresting if you haven’t. In the end, while I don’t think I enjoyed this story as much as I did the Divergent series, I applaud Roth’s world-building, character writing, and ability to write such complex plots and the imagery of this futuristic world. It is still unlike anything else I’ve ever read and I did absolutely enjoy it. This is the third book of the ongoing An Ember in the Ashes series. Book four is so far unannounced, but I’ll definitely have it on preorder as soon as possible! This has turned out to be one of my favorite YA series. I never reviewed An Ember in the Ashes, but I did review the second book, A Torch Against the Night, in 2017 and gave a little backstory for book one as well. You can read that review here. Our main characters are all separated and consumed by very different concerns and goals as this book begins, but slowly their paths begin to cross again. War has broken out across the nation and everyone is doing what they can to stop the Commandant from overthrowing the Emperor, though they’d sure like that guy out of the picture too. I previously described some of the action in this series as “Game of Thrones-esque” and I’m still holding to that…some of the action in this story can be so brutal! This third book includes chapters written from the perspective of additional characters whom I really enjoyed getting into the minds of this time around. You are taken along through this world by such varied perspectives, which really deepens the story and keeps you hooked. Another comparison to GoT is how each character is caught up in their own scenarios, like the varied characters in GoT, but how everything that is happening to each of them is connected to the overarching plot. The world-building here is so deep and interwoven, you can’t help but to get caught up in the web. War Storm is the fourth and final book of the Red Queen series. I read Red Queen and the second book, Glass Sword, back to back in 2016 and was absolutely hooked. Unfortunately, I wrote a terrible review for the third book, King’s Cage, in 2017 because I am an absolute idiot; while I still hold that King’s Cage was my least favorite of this series, it probably has a lot to do with the fact that I thought I was reading the third and final book of the series! Seriously, I had no idea a fourth book was planned and I read that third book as though it was supposed to be wrapping things up instead of just moving the story along. When things didn’t seem to come to any conclusions, leaving a lot of questions unanswered and a lot of things askew, I couldn’t figure out what had happened to this story I had loved so deeply in the beginning. While I definitely owe it to this series to go back and re-read King’s Cage, I didn’t let my mistake keep me from preordering the actual finale to this wonderful series, and I’m so glad that was the case. I refreshed my memory of the events of Kings Cage online and then dove into this book excited to see what more these characters would get into, hopefully giving me the closure and answers I was wishing for. And the result? This series has to be one of my favorites I’ve ever read, even through my book three problem. Despite being nearly 700 pages long, I flew through this story in days, unable to put it down until late into the night, desperate for the next bit of action, line of dialogue, and plot twist. New perspectives are shared through chapters told by both new and familiar characters, which I loved; I even ended up having a soft spot for previously-despised character Evangeline, whose perspective added depth and rich new ideas to cheer for. While I’m not sharing much about the plot here, I highly recommend checking out this series (all four books, haha,) if you enjoy action and fantasy. While it does involve romance and technically is YA, this story is a little Hunger Games, a little X-Men, and a little Game of Thrones all mixed up together. Though mostly, this series stands strong on its own. I have been seeing this series making the rounds on book review blogs and various Instagram accounts over the past couple of years, but never as much as since the trailer for the upcoming movie hit the internet. Curious, I gave the trailer a watch and decided I needed to look more into the book behind the film. Honestly, I bought this thinking it would be a “beach read” type of story, something light and entertaining I could take to the beach with us in a couple of weeks and enjoy while not paying too much attention. I was wrong! This book is very detailed and the storyline is incredibly well put together; you get caught up in it almost immediately. It definitely didn’t last long enough for me to take it to the beach, because I finished it in just a few days. When Rachel’s boyfriend Nick invites her to Singapore for the summer to attend his best friend’s wedding and meet his family, she has no idea what else is in store for her. She quickly discovers her humble professor beau is actually the heir of one of the wealthiest socialite families in the country. Switching through various points of view, we get to know Rachel, Nick, and several of his family members and what their intentions, suspicions, and true colors are. Many reviews have condoned the number of details given as the story progresses, and I’m partially in agreement because it makes the book hard to start. I spent a good amount of time in the beginning unsure of what information I needed to retain, afraid if I missed something I would be lost later, but I eventually learned this was just done for emphasis and style and that I didn’t need to remember everything. Besides that, the characters were well written, varied, and realistic and I truly started to form attachments (or disdain) for them through their situations and personalities. While I’m not rushing out to buy the sequels to this book immediately, I am looking forward to seeing the movie, which comes out August 15. To make up for the fact that I no longer have something to read at the beach, I’ve just ordered copies of Out of the Easy by Ruta Sepetys and Children of Blood and Bone by Tomi Adeyemi. Neither of these are something I’d consider “beach reads,” but they’ve both been on my TBR list for far too long. And speaking of Ruta Sepetys…I’ve been stalking her Twitter for years for news of the movie based on her book Between Shades of Grey, my favorite book I read in 2016. She finally posted this week that worldwide release has been slated for October 12, with specific US dates to be announced soon. I’m so excited! Click here to learn more about the movie, titled Ashes in the Snow. Emily, you have given me – by FAR – the best, most comprehensive, and most ‘I-get-you-all-the-way-girl’ review I’ve ever received in my life. You effortlessly managed to put the message I desperatedly tried to convey into just a few easy, simply words. YOU should be the writer out of the two of us! I truly hope you will write your book, one day. I know that I’ll be reading. Miriam, I am so touched that YOU were so touched by my review! I’m glad you felt like I was able to convey what you wanted to with this story. I do hope I’ll be writing my book one day…we’ll see! You’ve definitely been an inspiration to just make it happen! Crazy rich asians has been on my TBR. I have to read it! Yes you do! Do it before the movie comes out! Bringing Up Bebé sounds really interesting and like a fun parenting read for sure! I’m totally wanting to read Crazy Rich aAsians- everyone has been talking about it. Thanks for sharing! Read it before the movie comes out! I think you’ll love it! The “King’s Cage” is my least favourite in the series as well – I haven’t read “War Storm” yet but I’m excited to! 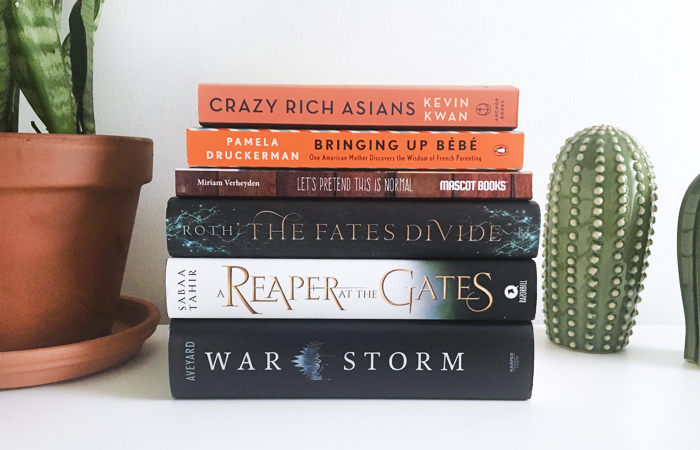 I have ‘Crazy, Rich, Asians” on my shelf in my to-read pile! Definitely don’t let King’s Cage get in the way of you reading War Storm! I totally loved it.